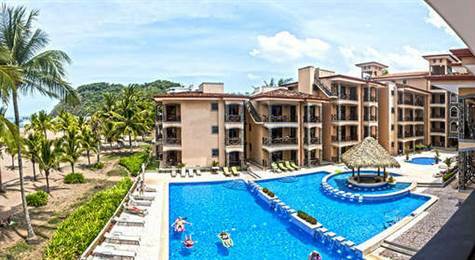 Experience Costa Rica in comfort and luxury in this sprawling Ocean View fully furnished 3 bedroom / 2.5 bathroom 5th floor condo with the pristine sandy beach of Jacó right at your doorstep. This unit comes completely furnished and outfitted down to the linens and utensils. The living area has plush sofas to relax on and a flat screen TV. The kitchen has stainless steel appliances, granite counters and a breakfast bar. The master bedroom has in suite bathroom and sliding doors that open up directly to the terrace so you can experience sunset dinners or relax and soak up the sun. The There is also an in unit laundry room with full size washer and dryer.